This week Food for Thought has travelled to London. The idea is to find food related day trips for the upcoming summer holidays, but I think most people can see through that thinly veiled excuse for a day in London. It all started when Food for Thought regular Sam Pidoux asked me if I had ever been to Borough Market. The answer was no. She began to tell me all about the variety of stalls, food and drink all housed in one little market in London. So to find out what was so different about this market to all other markets Sam acted as my tour guide. 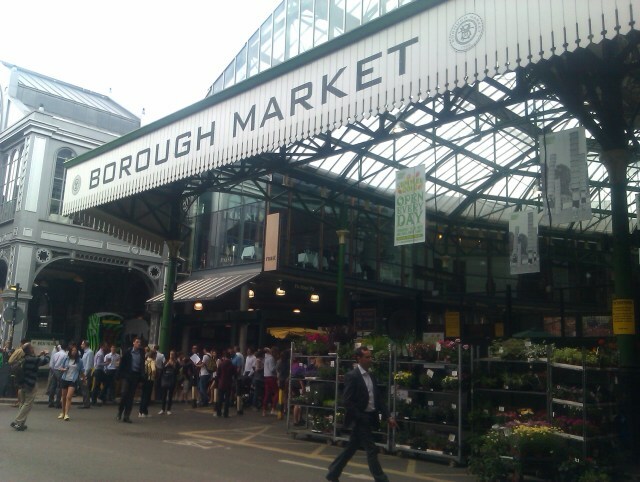 If you get chatting to people who have been to Borough Market you will find they will not stop talking about how great the place is and how it is a real highlight of living in London. Yet when you get there and walk between aisles of cakes, fresh fruit and then find yourself inside a Spanish deli you do understand their enthusiasm. A lot of the food you find in Borough Market you could find at any other kind of market, but the difference is they are the best. You need to win your spot at the market and explain why your stall needs to be there to represent the food make up of the UK. 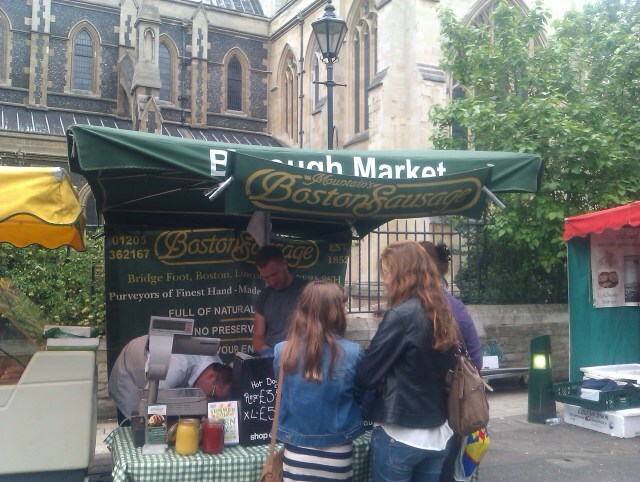 Even in London we found food stalls representing the best of the East Midlands with the Boston Sausage stall as well as a lady selling the famous Melton Mowbray pork pie. I also liked how the whole area around the market embraced the idea of food. There was all sorts of fancy restaurants, local pubs and delis in all the streets surrounding the market. Sam grew up in Germany and when leaving the market we stumbled across a German deli. Inside was all sorts of spices, chocolates and snacks that I had never heard of but Sam instantly recognised. It was great to find a shop so dedicated to showcasing genuine German foods, even though most people nearby would have no idea that these products existed. While we were in London we found a couple of other food attractions to pass the time. 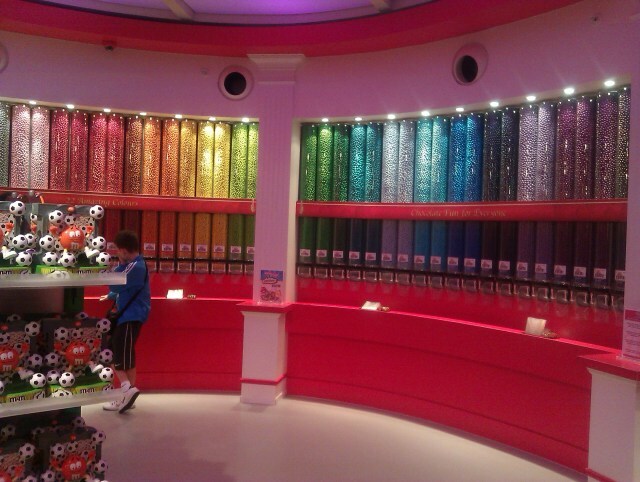 A quick tube ride away from Borough Market, we entered M&M World in Leicester Square. If you had ever wanted to know how many items of clothing and pieces of stationary could have the M&M logo on then this is place to visit. However, the best bit is just the tubes of every colour of M&M. You pick up a bag and are free to pour yourself as many sweets as you want. If you really want you could buy a bag that consists of only grey M&Ms. But there is a childlike feeling that overcomes you when you are given the power of making your own bag of sweets. To end the day we went to the Haagen-Dazs restaurant, which is dedicated to serving icecream. Flicking through the menu it is amazing to look at the yummy combinations they have made. It is also very decadent to be sitting in a restaurant in central London to only order a scoop of icecream, but it is enjoyable. If you have enjoyed this rambling food tour of London, then make sure you listen to Siren FM on Wednesdays at 2pm for new episodes of Food for Thought.